The latest installment of RSP’s Alternate Dungeons-series clocks in at 12 pages, 1 page front cover, 1 page editorial/ToC, 1 page advertisement, 1 page SRD, 1 page back cover, leaving us with 7 pages of content, so let’s take a look, shall we? So what is this series? In case you haven’t read my reviews of the previous installments of this series, the basic idea is a simple one: Always adventuring below the surface becomes boring. Instead, this series is devoted to providing essentially dungeon templates, for, as we all know, changing one component of an environment can have significant repercussions for different aspects of gaming – under open skies, you e.g. have no ceiling to limit flying or drop things on your players – no rocks fall, none die. Hence, the genius of this series lies in short and concise modifications, pieces of fluff and crunch, we get an array of options custom made to help the dungeons feel more than just like a different change of coat. This time around, our section on defining the dungeon in question obviously centers around existing effects and the placement of shrines, taking the presence of hidden symbols, symbolism, potential advantages for flying adversaries and yes, even the improved acoustics many such places have by design in mechanically-relevant terms into account. Beyond the danger of damaging magical symbols, a concise list of suggestions regarding the loot to be found herein can also be considered a nice way of further increasing the immersion and making the dungeon feel more distinct. Of course, there are more things to ponder and the pdf guides the GM through the process – from the function that led to the creation of the complex in question (and/or its fall!) to a concise table of potential dressings to add to your abandoned temple, the pdf provides some rather nice suggestions. Surprisingly, my least favorite component of the series, the by design often a bit conservative monster-suggestions this time around managed to evoke a solid diversity and so did the suggested sample traps. Where the pdf goes beyond its previous brethren would be with the inclusion of two haunts with a rather evocative imagery – hanged priests and an idol to an insect demon provide two rather nasty surprises for PCs. Kudos! The final pages is devoted to adventure hooks and while all share in common that they may not win the prize for being utterly ingenious, they do manage to evoke a sense of threat, with a particularly vile cult devoted to silence sporting a downright grisly imagery I considered rather fitting – Golarion’s Mute God, anyone? Editing and formatting are top-notch, I noticed no glitches. Layout adheres to RSP’s two-column b/w standard, is printer-friendly and sports evocative, awesome artworks. The pdf comes fully bookmarked and in two versions, one optimized for the printer and one optimized for screen-use. It’s not easy taking following up on anything Alexander Augunas made – unless, it seems, you are Mike Welham, who has been a no less prolific and frequent candidate and winner on my top ten lists. Mike’s talent does clearly show in this installment of the series as well – and while I personally do not consider the concept of an abandoned temple to be as compelling as some of the previous installments, that ultimately is a matter of taste, not objective quality. 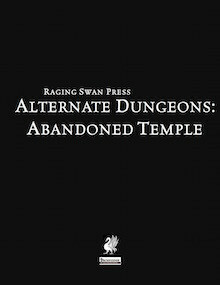 Ultimately, Mike Welham delivers a great supplement full of intriguing details that should help render dungeons in any temple-context less predictable and more concise – a great, inexpensive supplement and well worth a final verdict of 5 stars + seal of approval. You can get this great toolkit here on OBS and here on d20pfsrd.com’s shop! You can also subscribe to RSP-releases and support the wages paid to freelancers here on patreon!